Just when I got all excited about doing my first Just Add Ink challenge, they went and gave me a bright colour challenge - Melon Mambo, Taken with Teal and Elegant Eggplant. Now I love each of those colours, but if you follow my blog you will know I'm a vintage, shabby, muted kinda girl (and my cards too, lol). But hey, that's what challenges are for right? Luckily I did have to whip up a quick card for Sam to take to a party today, a gymnastics party for one of his lovely friends from creche. So instead of a quick card I rose to the challenge - what girl doesn't like flowers and butterflies right? So here is JAI Challenge 19. Cardstock / Ink: Taken with Teal, Whisper White, Basic Black, Elegant Eggplant and Melon Mambo. Accessories: Melon Mambo polka dot ribbon, Elegant Eggplant grosgrain ribbon, rhinestone brads, Bigshot and Timeless Type Junior Alphabet. Thanks for popping by. Lovely to be doing some challenges again, have a couple more I'd like to do this week but it's back to shabby and vintage for me!! I'm glad I managed to get some swaps done for Sydney Convention in the end, because I always come back with so many fresh and inspiring ideas and colour combinations. Here are some of my favourites - always a hard job to pick favourites as I loved them all, but these really inspired me so I asked the girls if I could showcase them here. This gorgeous creation is by Teresa Dabrowski. Teresa doesn't have a blog (she did promise me one was coming though!) but if you are anywhere Nicholls in ACT, you can contact Teresa for a workshop. I loved what she has done here with Vintage Vogue, particularly the gorgeous colours of Black, Basic Gray, Rich Razzelberry and Pretty in Pink. Isn't it gorgeous? I will definitely be casing this colour combination VERY soon.Thankyou Teresa. Next up I have this fabulous creation using the emerging colour technique with Organic Outline and Medallion stamp set created by Claire Harrison. I love the crisp colour combination of Whisper White, tempting Turquoise and Basic Gray. Such a fabulous card! Thankyou Claire. Next up is this little gem from my lovely friend Vanessa Webb. So many things I love about this card, but I think it was the colour combination of Soft Suede, Taken with Teal, Old Olive and Very Vanilla that got me first. I also love the layout of the card, the ribbon detail, how she has done the greeting and the little embossed bit on the end. OK - just everything! So much exquisite detail! Thankyou Vanessa. This lovely patchwork creation was created by Sharon Turnbull who doesn't have a blog but can be contacted by email if you are after a workshop in the Caloundra area. So much work has gone into this - I LOVE it. The colours, faux stitching, flowers etc all remind me of a homely warm quilt. Thankyou Sharon. I have one more to show you, just waiting on the OK from the creator. In the meantime, here is the swap I made. I used an old favourite set for christmas, Lovely as a Tree with some reverse masking and a border from Vintage Vogue. There's also some bling and paper piercing in there too. I hope that has given you lots of stamping inspiration. 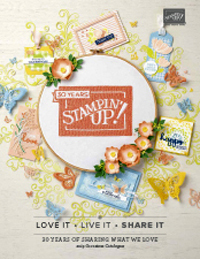 So many clever stampers in the Stampin' Up! community! I left for Sydney a day early this year so I could have a day relaxing and catching up before Convention. That was a good move as I spent the day catching up with my lovely downline Miriam from Kalgoorlie in WA. We don't get to see each other too often, so it was nice to share a leisurely stroll and ferry ride, followed by a long lunch with a couple of my other downlines Sue Madex and Katherine Manglesdorf. Here's Miriam and I playing tourist. and me seeing the sights of the harbour the cheap way - by ferry! This year the Managers Convention was the night before Convention, so there was lots of hugging and chatting and catching up. I was thrilled to be able to have two of my team join me this year at Managers Convention, Sue Madex and Miriam Thomas. I was such a proud mother hen!! We were given these awesome big mugs / soup cups with the Share a Cup stamp. Here it is with Yvonne, Jayne, Joanna and Linda. It was so great to see these girls again. Convention itself was CRAZY the first morning - I didn't even take my camera because I wanted to have room for swaps and Momento Mall. I was a bit slow off the mark with both this year (too much chatting) but ended up with some lovely swaps which I am still oohhing and ahhing over. I did manage to squeeze my camera in Saturday though and here are some snaps. This one is me and my lovely friend Jacqui Crouch from Tenterfiled NSW. Jacqui is so down to earth and full of great advice (not to mention SO cheeky!) - was lovely to have a real life photo with her. and my beautiful mate Nicki T who is always there with a hug and a smile. and my beautiful Thursday night stamping friends Christine and Judy, who joined my team this year and got to enjoy their first convention (well Judy's second but first as a demonstrator!). It was so awesome to have so many of my Art with Heart team in Sydney this year - I think we had 24+which was a big effort. You wait til next year in Melbourne!! Thanks to everyone for coming along, it really made it a special convention. I've already shown one of the team pics in the last post, but here is our table at Convention dinner. and how gorgeous were the tulip bowls?? Finally I wanted to acknowledge the success of some of my fabulous team who got to walk across stage for sales and recruiting awards, and Sue Madex who came in at number 15 in Demonstrator of the Year, plus Miriam Thomas, the first ever Rising Star for Stampin' Up! There wasn't a prouder mother hen in the room. Well done girls!! I didn't catch Sue on stage unfortunately, but I did get this pic of Miriam. Then there's this photo, my Shelli hug for Demo of the Year. I was trying so hard to not crush the poor lady to death, but also wanted her to know I was mighty chuffed to be acknowledged in such a way, especially after a difficult year. I am very proud and incredibly spoilt to now own a Burberry handbag (I feel like a plus size Carrie Bradshaw!!) and necklace. Wow is all I can say. 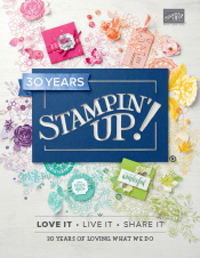 Thankyou Stampin Up! I think that's it for my first Convention Installment. I want to pop back soon with news about the fabulous presentations. I feel so inspired and motivated - if you didn't make Sydney you have to start putting some cash away each week for next years convention in Melbourne. It's going to be a blast. Join the Art with Heart Team at 20% off - Friendship, Support, Sharing. I think the three words Friendship, Support and Sharing most sum up our team (although you can probably add success in there after Sydney too!). 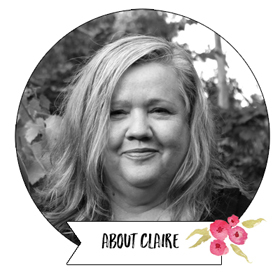 I think our online forum and face to face catch-ups has really created a fabulous culture in our team that everyone just loves to be a part of because they feel nurtured and loved and supported as a person, wife and mother as much as a Stampin' Up! Demonstrator. I would love to have more people join my fabulous team. We have demonstrators right throughout Australia you can hook up with, and with our very active online forum it will feel like you live next door anyway! The cool news is, you can do it cheaper then ever at the moment - just $259 - a saving of $65! That's such a steal, and you will get everything you needed to get started - over $560 worth of stamping supplies (you can choose which stamps and colours) and business supplies. It's easy to join and quick. Just call me today on 03 97352946 or email me and we can chat! Join in the excitement as we welcome the new catalogue! Had no idea what to title this post with but felt the need to say SOMETHING! The last 3 days have been a total whirlwind with the Stampin' Up! Convention which has left me feeling so appreciated in the blogging world. Those people that came up to me and introduced themselves and talked about Josh and also how much you loved (and missed) my blog and seeing my creations, was so appreciated and special. Thankyou! I do still miss blogging and I will definitely be starting some posts again soon. I just miss creating and sharing and participating in some challenges. I am feeling inspired and motivated and have a thousand ideas running around in my head, but need to unpack and spend some time with the boys and come down to earth! I was incredibly proud to have my achievements recognised at Convention last night.To be awarded the Number 1 Australian Demonstrator of the Year just blew my mind. It was very exciting to see friends and people I have got to know so well (and some lovely new faces) being awarded as well. Sometimes the clapping and wooping is as much fun as the walking because you know how much we all love what we do. The Art with Heart girls had a fabulous night with Sue Madex named number 15 in Demonstrator of the Year and Miriam Thomas to win the Rising Star award for best new demonstrator. We also had lots of girls recognised for sales and recruiting. I also was named number 2 for recruiting and number 1 in the Leadership category, thank to my fab team. I was given beautiful Burberry bag and also a Burberry necklace - both just stunning and something I would never buy myself. I feel like I have a little bit of Shelli in my wardrobe now! 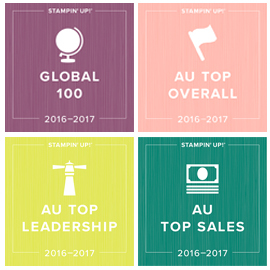 Something very special to many of us that have been on the receiving end of her unconditional love and support, is to have been there to watch Jayne Mercer receive the Heart of Stampin' Up! award. So richly deserved by a truly wonderful person. I learnt some great new stuff and received some beautiful swaps at Comvention. I'll be back at some stage soon to give you more news and photos - but just wanted to say how proud and thrilled I was :) I've been contacted by so many people today, and it meant so much to me to hear / read your lovely messages. Thankyou so much :) Thanks also to Shelli, Aaron, Emma and all the fab staff in Australia and the US for an amazing and inspiring few days.